Numerous youths are indicative of the parish’s vibrant family life. Ground was broken for the “new church" in 1964. Cardinal Dolan addresses the faithful of Regina Coeli parish in Hyde Park, including the parish administrator, Father Brendan Fitzgerald, at right, during the closing liturgy of the parish’s 150th anniversary year Oct. 25. Regina Coeli parish in Hyde Park had a happy problem a year ago. Due to high demand, by the time the 11:30 a.m. Sunday Mass began, the supply of church bulletins was depleted. This occurred on a regular basis, following the parish’s four previous weekend Masses, which included one at its mission church, St. Paul’s in Staatsburg. “We’ve experienced a lot of growth in the last two years here at the parish—we’ve had to order 100 extra bulletins,” said Father Brendan A. Fitzgerald, parish administrator. The bulletin predicament proved to be a present in itself, as the timing coincided with the opening of the parish’s 150th anniversary. Regina Coeli has 1,200 registered families. 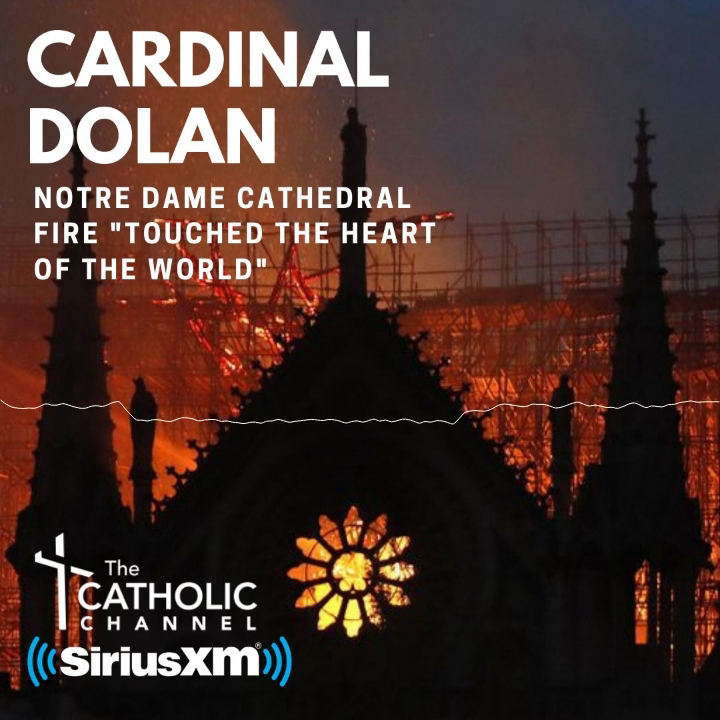 “One of the most beautiful sounds we have here—we’ve got lots of families—you will hear children crying at our Masses,” Father Fitzgerald said. “It’s one of the things I love most about being here. They learn how to be in church, and they learn to love being in church. The principal of the parish school is Linda Power. The coordinator of religious education is Kathie Depew. An oil portrait of the Madonna and Child, gifted to the parish years ago by Sara Delano Roosevelt, mother of President Franklin Delano Roosevelt—although not Catholic, the country’s 32nd president was born in Hyde Park in 1882—has graced both the old and new churches. A copy of the renowned 17th century painting by the Spaniard Bartolomeo Murillo hangs in the current church above the choir loft; in the old church, it was displayed over the main altar. In addition to young families, there are also a number of elderly parishioners who lend their wisdom and experience to the parish, according to Father Fitzgerald. There’s something for everyone at Regina Coeli, including groups geared to men and youth. The parish also has a Legion of Mary, a pro-life group and a food pantry. From the cleaning of the church interior to the landscaping outdoors and the care of flowers everywhere, “there’s a great spirit of volunteerism in the parish,” Father Fitzgerald said. The homebound remain a part of the parish as well, such as through transportation provided to and from the church for the Dec. 5 virtual pilgrimage of Lourdes, an interactive experience that was “almost like bringing Lourdes to the church,” he said. A highlight of the anniversary year was the priesthood ordination of Father David Y. Rider Jr., who was raised in Regina Coeli. The day after his May 24 ordination at St. Patrick’s Cathedral, Father Rider celebrated his First Mass at Regina Coeli Church. “It was a special grace for the parish as a whole, to have the joy of seeing one of their own ordained to the priesthood,” Father Fitzgerald said. He believes the fruit of the ordinand’s vocation ripened through the fervent prayers of parishioners who frequently spend time in church before the Blessed Sacrament during Adoration the parish provides in its chapel throughout the week from Monday after the 9 a.m. Mass through Saturday before the 9 a.m. Mass. “It validated our devotion to the Eucharist and our Blessed Mother and really focused the whole parish on what was important,” Father Fitzgerald said. A former priest secretary to Cardinal Egan, Father Fitzgerald, 41, was ordained in 2000 for the Diocese of Limerick in his native Ireland and was named administrator of Regina Coeli in 2012. “It’s been a place of great growth for me, personally, as a priest and as a person,” he said. “There are people who give great example with the witness of their lives, their love for the Eucharist and the way they serve the Lord,” and each other.